Biannual reporting was submitted to the Commonwealth on 31 January for the first half of the financial year July 1 to December 31 2018. 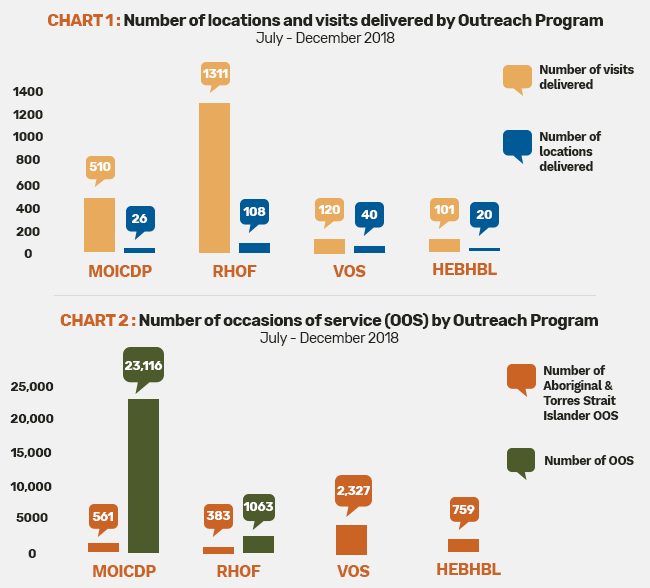 Outreach service providers (OSPs) delivered a total of 2,042 face-to-face and telehealth visits across Victoria with 194 locations including Aboriginal Community Controlled Health Organisations, health services, GP practices, community health centers, and other primary care services. The Program Administrators have been working closely with OSPs and their finance departments/administrators to ensure invoices and data summary sheets are submitted on time so that reporting is completed in a timely manner. The Regional Program Officers have been working alongside OSPs to support them where patient numbers have been low to look at ways of increasing numbers and reducing the number of did not attends at outreach clinics. This is an ongoing team effort between RWAV, OSPs and finance teams to ensure the efficient processing of invoices, data reporting and client care. Chart 1 provides a breakdown of the number of visits per Outreach program. OSPs delivered 28,209 occasions of service of which 4,030 were to Aboriginal and Torres Strait Islander communities. Chart 2 provides a breakdown of the number of occasions of service per Outreach program.